When you’re stuck in the rain, there is nothing worse than having your clothes soaking wet. While this might be a small annoyance on a regular day, it can turn into a life threatening emergency if there is a disaster. You could be hiking and get lost with a rainstorm in sight. When the rain soaks your clothes, you could die from your body temperature being too low. While this would not happen if your clothes weren’t wet, it could happen if they were. Because of this, everyone needs to carry a disposable poncho in their survival kit. While it might seem like a silly thing to carry around, it is actually much needed. These ponchos can help keep the water from soaking through your clothes, which is a dangerous occurrence. When you’re looking for a rain poncho, you want one that is going to be easy to carry. That’s what is so great about these rain ponchos. They are intended for a one time use, so they are packaged conveniently for you to carry on whatever adventure you might find yourself on. They are breathable, easy to pack, and very lightweight. These ponchos can even fit in your backpack or pocket! The great thing is that they come in multiple colors, so you can choose whatever color would be easiest to see with your family in them. You don’t only need these for an emergency, they can be used whenever you want! If you’re going to an amusement park, use these for those water rides that are so much fun but you don’t want to get wet on. Or if you’re at a football game, keep the rain off of you so that you don’t need to leave early. When you purchase these disposable rain ponchos you’ll get a package of 5, 10, or 200 depending on what you choose. 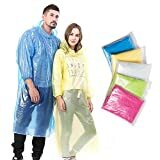 These ponchos are really lightweight, but they are heavy duty enough once opened to keep the rain off of you. They are much more breathable than you would guess, so you won’t be sweating or feeling claustrophobic while wearing them. Since they are so small they can literally fit almost anywhere, making it the perfect travel companion. At just $15 for 10 ponchos, you won’t find a better deal anywhere. 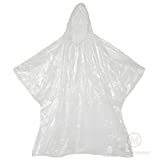 With such a cheap price, everyone needs to purchase these to keep with them when rain catches you off guard. The sleeves are a bit short. It would be better if they would extend longer for adults. If you are looking for something to keep you dry when you’re caught in the rain, this is a great option. The water runs off of it and they are cheap. Since they are disposable you’ll never have to throw a wet jacket into your car. It’s a great product for anyone who wants to stay out of the rain but doesn’t have a choice. Highly recommend it. We are a group of survivalists and preppers that are here to review products and give you the information that you need for the end of times.